King Edward II, 1860. 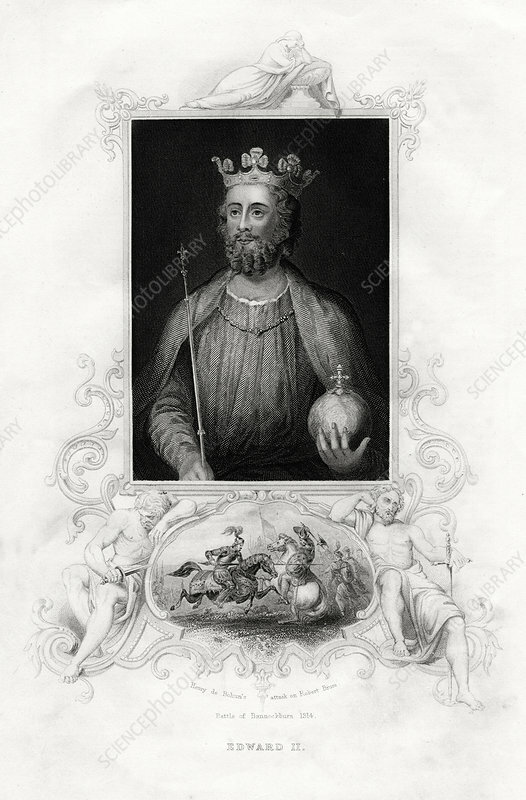 Edward II (1284-1327) succeeded his father, Edward I, in 1307. His reign was characterised by friction with the barons, who in 1311 drew up a document called the Ordinances, which imposed restrictions on the king's finances and power of appointments, as well as leading to the execution of Edward's unpopular favourite, Piers Gaveston. Edward's defeat by Robert the Bruce at Bannockburn (1314) led to his authority being still further emasculated, but in 1322 Edward freed himself from the control of the barons when he defeated and executed Thomas of Lancaster, and revoked the Ordinances. In 1326, Edward's queen, Isabella of France, assisted Roger de Mortimer, a baron exiled in France who was also her lover, in planning an invasion. Deserted by his followers, Edward fled and was captured attempting to escape by sea. He was imprisoned, forced to renounce his crown, and murdered, at Berkeley Castle in Gloucestershire.